Copy received from Rachel’s Random Resources for review purposes. I am a huge fan of Anne Allen’s writing and have enjoyed many of the books in the Guernsey series, each of the so different yet so rich in characters and wonderful settings. The linking of two timelines always appeals to me in a novel, and I know from the outset that any of Anne Allen’s books will be just the right mix of modern day and historic setting. With characters in 2012 and 1862, we span a few centuries but see in both of these times circumstances that impact on society then as much as they do now. Eugénie in 1862 is mourning the loss of her new husband, his death at sea robbing her of happiness and companionship, and so a chance meeting with Victor Hugo opens her eyes to a world she could never have imagined. She is a character that we slowly watch transform through the pages, the once quiet and withdrawn young woman becomes more confident, more sure in her own skin and begins to move on after the early tragedies that befell her. The friendships she forms are a lifeline for her, they are a comfort to her and they enable her to be Eugénie again, and not just a sad widow. 2012 brings the reader the story of Tess, a young doctor finishing off her training in Exeter. Stunned to learn that she has inherited the home of her Great- Aunt on Guernsey, she makes the life changing decision to move back to her beloved island, and make a life there. But if that wasn’t enough to deal with, there are the simple matters of family politics, clearing out the possessions of her Great-Aunt and unravelling a myth that has run through her family for generations, thrown into the mix. In both Eugénie and Tess, we see strong female characters who take control of situations they are in. There are times that life throws them a curveball, makes things somewhat difficult for them, but these women are wonderful to watch, they take it in their stride, use the events to give them courage, strength and ultimately adapt. The mystery element of the plot is fascinating, readers follow Tess as she pieces Eugénie’s life together to form a narrative that gladdens and breaks the heart in equal measure, as well as experience events through the perspective of Eugénie. In Anne Allen’s hands, this is done with sympathy as well as highlighting the harshness of situations that her characters find themselves in. There’s something comforting about picking up a book from this author, she has a wonderful way of bringing a story alive with rich and atmospheric settings, I felt like I could see the sights of Guernsey, like I could see the houses that she described, I felt like I got to know the characters and became so invested in them. I shared their frustrations, their sorrows, their confusion and eventually, their happiness. Of all of the Guernsey novels, I think that this has been my favourite so far, I can’t quite put my finger on what it was that grabbed my heart, but something about this book has lingered on after I read the last page. It’s perhaps just my head wondering “what next?” for Tess, her family and her friends, but I do know that I thoroughly enjoyed this book and absolutely recommend it, and all of the books. All of the books in this series can be read as standalone. Check out Rachel’s Random Resources for the blog tour! I think it would be fair to say that this book was a great starting point for me wanting to know more about asylums and health care in the 1800s in Britain, especially after reading chapters about the creation of specific facilities for the treatment of those deemed criminally insane. 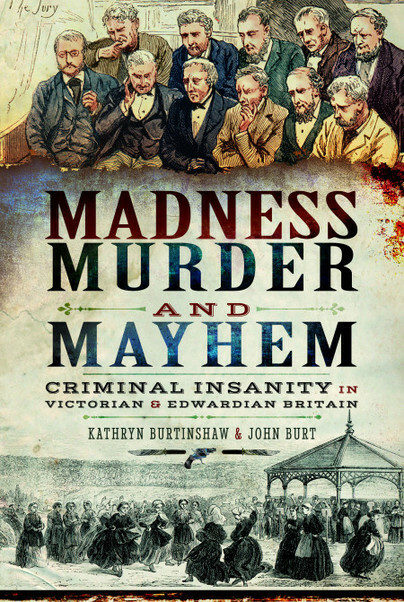 The case histories used in each section of the book make for fascinating reading, and it’s interesting seeing how society and medical professionals saw and understood those who had mental illness or committed crimes because of mental illness. The sections on mentally weak habitual criminals and idiots and imbeciles really opened my eyes and had me asking so many questions after reading the case histories. The ideas at the time were often that poor parenting and poverty were the cause of some mentally weak people. A former governor and medical officer of Holloway Prison commented ‘some criminals are of bad or degenerate stock’ and ‘different to skilled criminals who would not have recruited associates of low intelligence’, and I do think that this is a very powerful way to see people. The arguments that took place at the time of how to define individuals makes for interesting reading, and it was often felt that it would be in infringement to lock people up because of what was deemed to be a low intellect. Which was in contrast to those who were of the belief that segregation and strict birth control would contain those with learning disabilities. Alarming really when you consider the views of the Eugenics Education Society at the time. The theme of poverty is covered along with infirmity and illegitimacy, which involved societal issues such as employment, sickness and disability. These were contributors to the break down of families and often lead to families being admitted to workhouses. However, fear of workhouses was catalyst enough for many, these ‘prisons for the poor’ were to be avoided and so many would descend into a spiral of poor mental health trying to keep themselves away from the workhouse and keep their families clothed, homed and fed. It’s a great honour to be part of the blog tour for The Librarian of Auschwitz today, even more so as I’m kicking off the tour with the first review. Set in one of the most notorious places of the Third Reich, Auschwitz-Birkenau, this is a powerful and emotive read that does not shy away from the brutal events that took place in Nazi extermination camps during WWII. Dita and her family are three of the many people moved from the Terezín ghetto to the death camp, where she takes on the dangerous yet thrilling job of being the librarian at Hut 31 in the family camp. Here children undergo lessons with teachers, allowing them a small sense of normalcy in such a harsh environment. This schooling shines a glimmer of light in a dark world and enriches their lives with stories and tales from the physical and the ‘living’ books that Dita has available. Being the librarian is a dangerous task, books are banned, and if discovered they could lead to the immediate death of any one in the camp, not just those in possession of the books. But for Dita, these books are precious, she spends time repairing them, appreciating them and learning as much as she can, for books give her a means of escape. Running the school is Freddy Hirsch, a character who struggles with his own troubles, but appears outwardly strong and dependable to those around him. His determination to do the right thing and ensure the safety of the people under his care is commendable, he is a very realistic character that you cannot help but be drawn to. The more you read of his life, the more invested you become in his tale and feel sympathy for him. The path that led him to Auschwitz-Birkenau was one that tested his heart and really had me wondering if I would have acted as Freddy did that situation. For me, the main character Dita was the one that really worked her way into my heart. Watching her grow and develop into a wonderfully complex character was very rewarding, and at times she seemed larger than life. On so many occasions she acted wiser and older than her years, but it’s important to remember that she was only fourteen. Seeing Dita struggle to make sense of events around her was a sharp reminder about her age, but her questioning of things also gives voice to the thoughts that many other people were thinking. And although I knew the most likely outcome for those in the extermination camps, I won’t lie, I held strongly onto the faith that something good would come of these events. It’s often easy to be swept away with the story, and I think that this is the sort of story that will live on in your head after you’ve finished the book. The emotions that this book pulls from you as you read are so strong, I found at moments it felt as though my heart was in my mouth, or almost reading through my fingers in places, fearing what fates may befall the characters. And once I was used to the narrative switching between the main characters, I was unable to put this book down. Although there are various accounts of life within the concentration camps throughout the Nazi empire, the writing here really brought to life the horrendous conditions that people endured, the fear, the pain the never ending hunger … it felt authentic and at times, uncomfortable to read. Included at the end of the book, the author has provided a brief note of the characters and their lives, what became of them etc, which I really appreciated. The explanations, where possible, allowed for closure.